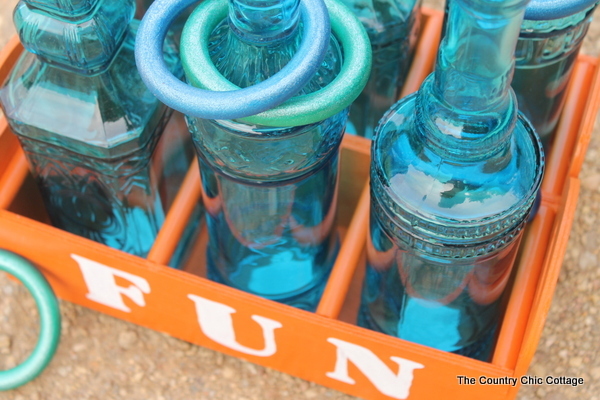 You can make your own ring toss game for fun with adults and kids. 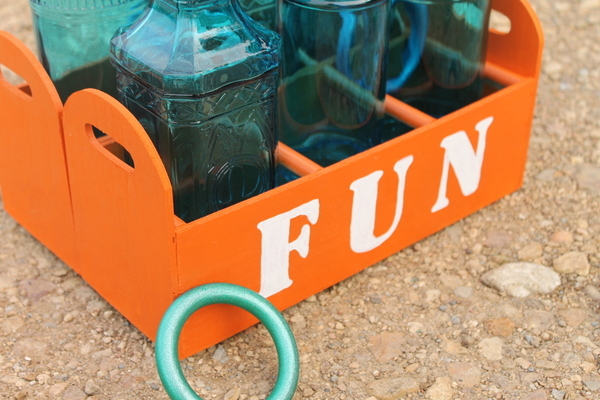 Grab some wood trays and decorative bottles to make this fun game at home. This one can be played indoors or out so be sure to make your own today as those dreary days of winter are ahead. This one was first posted over at the Darice blog but I thought y’all might enjoy it as well. 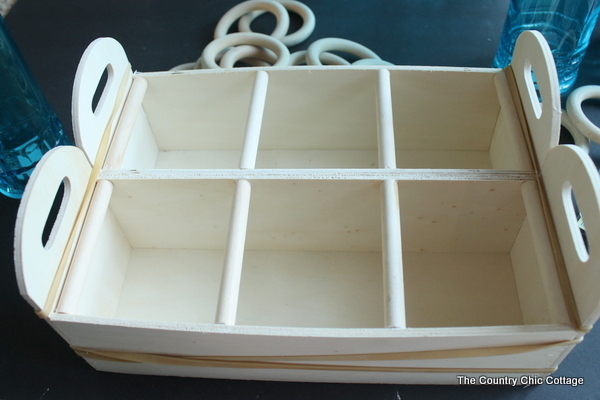 Start by cutting your dowel rod to fit inside the wood trays. Cut to length then sand the ends. I used a sander but you can sand by hand. Put those cut dowel rods in place as shown below. These should be placed so that your bottles will fit in easily. Do a dry fit before continuing. 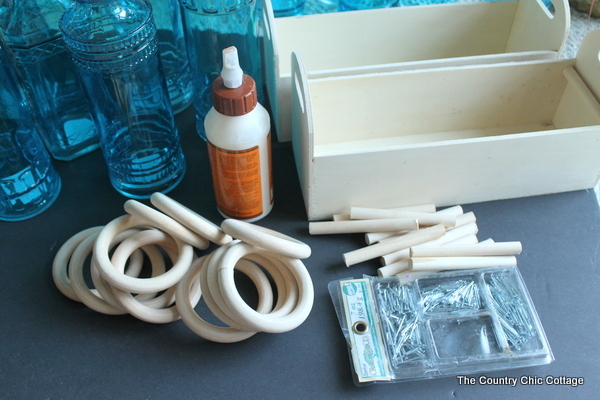 Use wood glue to hold dowel rods, as well as the two trays together. Clamp or use rubber bands in a pinch. Add nails to help secure. Allow the glue to dry overnight then paint the entire thing with a coat of orange Krylon. It may take a few light coats inside and out to get yours looking like the below. Allow the spray paint to dry and cure overnight especially if you are making this in the south during the summer! 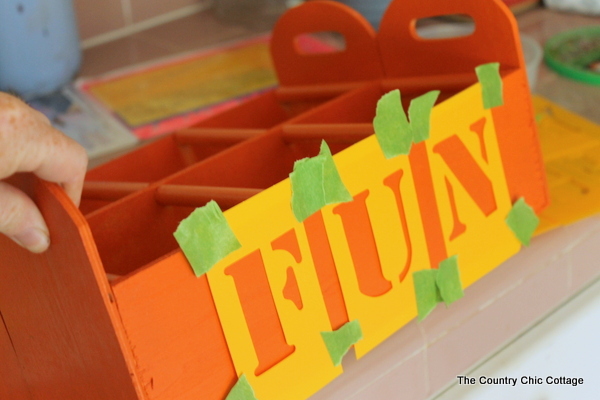 Add whatever word you like to the front using the stencils, craft paint, and a stencil brush. Use a fine line paint brush with the same craft paint to fill in any gaps left by the stencil. Compare the image above with the image below to see what I am talking about. I wanted my rings two different colors for a little ring toss competition! 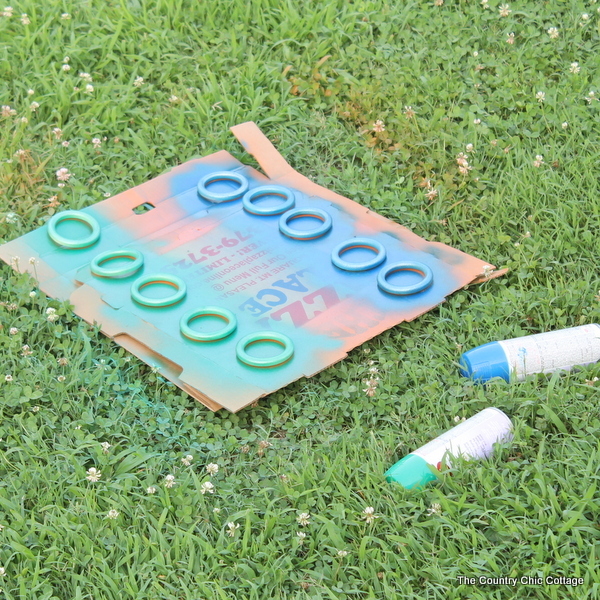 I used Krylon in blue and green to paint the rings outside. Paint one side, allow to dry, then paint the opposite side. 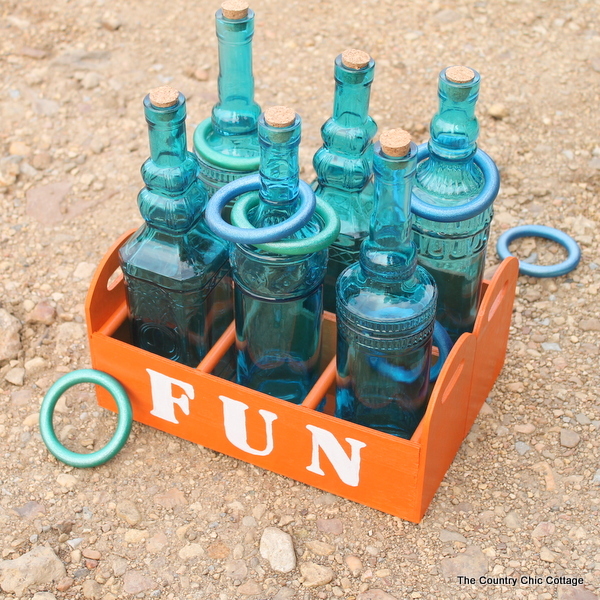 Add your bottles to the crate and you are ready for a friendly family ring toss competition. I obviously need to work on my ring toss skills. 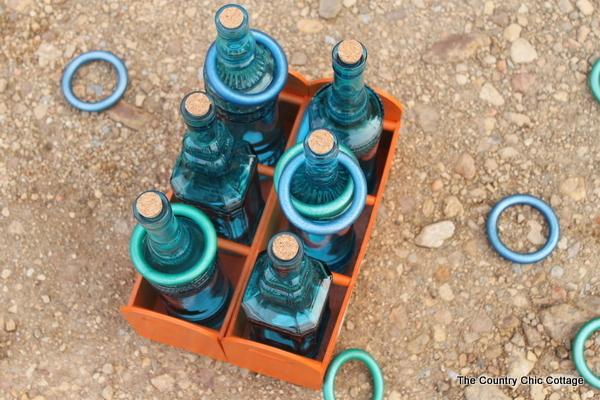 I actually had to put some of the rings on the bottles by hand to take these pictures. Sigh. 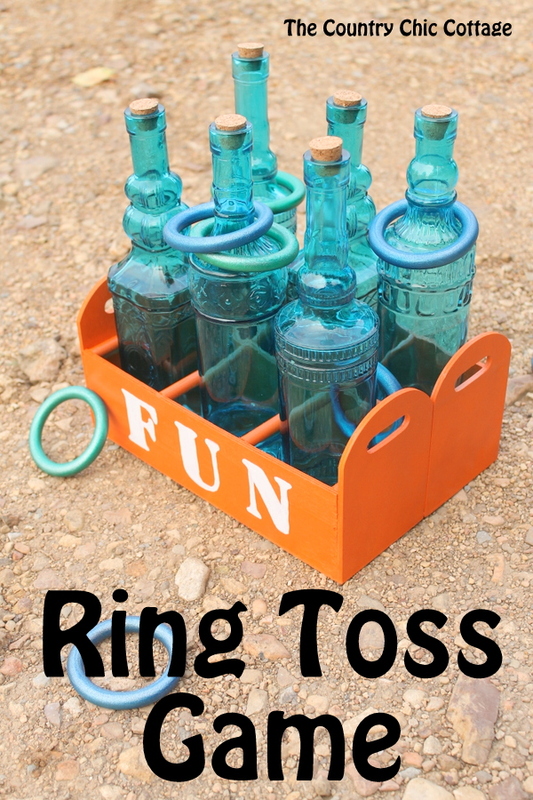 Be sure to gather the supplies to make your own ring toss game for your home. The kids (and adults) will love it!